One great advantage of the digital media revolution is the ability to access a wide range of views on current news events direct from a variety of sources. By directly accessing the American media you can contemplate the United State's position that Iran is part of an "axis of evil". The Iranian media has an opposing perspective and this can also be received with ease by digital satellite in Australia and New Zealand. Regardless of your views of the political and social conditions in Iran, the country has a rich history dating from the 6th century BC. Along with spectacular ancient cities, mosques and landscape, Iran's media offers an absorbing and often intriguing insight into a country which is never far from the headlines in the western world. A number of digital television and radio outlets from Iran are available via the Asiasat 2 satellite to the Pacific region. An Iranian 24-hour news television channel, The Alalam News Channel broadcasts in Arabic, though the news ticker tape than runs at the bottom of the screen is in English. 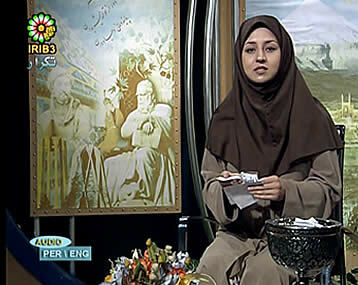 Broadcasting from studios in Teheran, Alalam provides news and commentary from the Iranian perspective. It may come as a surprise to see how often Australia is presented in the Iranian news media, with images of John Howard and Alexander Downer regularly appearing in news reports on the channel. Broadcasting from the studios of Islamic Republic of Iran Broadcasting (IRIB) in Teheran, Jame-Jam presents news, cultural and entertainment programs in Farsi. A number of live programs have a translated English language audio channel available in addition to the Farsi audio. Jame-Jam's programing regularly features cultural documentaries and Iranian travel programs that make for fascinating viewing. IRIB Radio 1 is a direct relay of the Sarasarye national network which is heard across Iran on both AM and FM frequencies. The station has a fantastic selection of Persian musical programs as well as the usual news and talkback in Farsi. Radio Quran is a relay of the 24-hour religious AM station heard in Tehran on 585 kHz. The programming is continuous readings from the Koran. Radio Maaref is a relay of the local "presentation" radio service heard in the city of Qom and provides a fascinating insight into Iranian life, religion and media. The Alalam News Channel and Jame-Jam are featured within the MediaExplorer package on DVD Disk One. IRIB Radio One and Radio Quran are featured within the MediaExplorer package on DVD Disk One.